"Tepin" redirects here. For the racehorse, see Tepin (horse). Not to be confused with Turkish pepper. Capsicum annuum var. glabriusculum is a variety of Capsicum annuum that is native to southern North America and northern South America. Common names include chiltepin, Indian pepper, chiltepe, and chile tepin, as well as turkey, bird’s eye, or simply bird peppers, due to their consumption and spread by wild birds. Tepin is derived from a Nahuatl word meaning "flea". This variety is the most likely progenitor of the domesticated C. annuum var. annuum. Another similar-sized pepper 'Pequin' (also called 'Piquin') is often confused, the Tepin fruit is round to oval and the Pequin is oval with a point, and the leaves, stems and plant structure are very different on each plant. Chiltepin is a perennial shrub that usually grows to a height of around 1 m (3.3 ft), but sometimes reaches 3 m (9.8 ft). and in areas without hard frost in winter, plants can live 35–50 years. The tiny chili peppers of C. a. var. glabriusculum are red to orange-red, usually slightly ellipsoidal, and about 0.8 cm (0.31 in) in diameter. Some strains of tepin peppers are much closer to perfectly round when fresh. If a tepin pepper is dried, it appears quite round even if it was slightly ellipsoidal when fresh. Tepin peppers are very hot, measuring between 50,000 and 1,628,000 Scoville units. The tepin can be hotter than the habanero or red savina, with the highest levels seen in green fruit 40-50 days after fruit set. However, since this pepper is harvested from wild stands in the Mexican desert, the heat level of the fruit can vary greatly from year to year, depending on the amount of natural rainfall that occurs during the time the fruits are forming. During drought years, fruit heat levels can be weak, and during normal rainfall years, the highest heat levels are produced. Also there is a large variation between the heat levels of the green fresh fruit (which are pickled in vinegar), red-ripe fresh fruit, dried whole fruit and dried fruit with the seeds removed, and their heat levels are arranged from mildest to hottest in that order. Around 50 tons are estimated to be harvested commercially annually in Mexico, primarily in Sonora. In Mexico, the heat of the chiltepin is called arrebatado ("rapid" or "violent"), because, while the heat is intense, it is not very enduring. This stands in contrast to the domesticated 'Pequin' variety, which is the same size as the wild tepin, but is oval-shaped, and delivers a decidedly different experience. The different drying methods used for the tepin and 'Pequin', can help tell these peppers apart. Tepins are always sun-dried, whereas the Pequins are commonly dried over wood smoke, and the smell of the smoke in the Pequins can help separate the two varieties. Pequins are not as hot as chiltepins (only about 30,000–50,000 Scoville units), but they have a much slower and longer-lasting effect. C. a. var. glabriusculum can be found in Texas, Arizona, and Florida in the Southern United States, the Bahamas, the Caribbean, Mexico, Central America, and Colombia. It prefers well-drained soils, such as silty or sandy loams, and 800–2,000 mm (31–79 in) of annual precipitation in Puerto Rico. It may be found in areas with a broken forest canopy or disturbed areas that lack tree cover if moisture and soil are favorable. Elsewhere, such as in Arizona, it may require the partial shading of a nurse plant. Chiltepin was named "the official native pepper of Texas" in 1997, two years after the jalapeño became the official pepper of Texas. In 1999, Native Seeds/SEARCH and the United States Forest Service established the 2,500-acre (1,000 ha) Wild Chile Botanical Area in the Coronado National Forest. Located in the Rock Corral Canyon near Tumacacori, Arizona, the preserve protects a large C. a. var. glabriusculum population for study and as a genetic reserve. ^ a b c "Capsicum annuum var. glabriusculum". Germplasm Resources Information Network (GRIN). Agricultural Research Service (ARS), United States Department of Agriculture (USDA). Retrieved 2010-06-23. ^ a b c d González-Zamora, Alberto; Sierra-Campos, Erick; Pérez-Morales, Rebeca; Vázquez-Vázquez, Cirilo; Gallegos-Robles, Miguel A.; López-Martínez, José D.; García-Hernández, José L. (2015). "Measurement of Capsaicinoids in Chiltepin Hot Pepper: A Comparison Study between Spectrophotometric Method and High Performance Liquid Chromatography Analysis". Journal of Chemistry. 2015: 1–10. doi:10.1155/2015/709150. ^ Singh, Ram J. (2006). Genetic Resources, Chromosome Engineering, and Crop Improvement: Vegetable crops. CRC Press. p. 203. ISBN 978-0-8493-9646-5. ^ Richardson, Alfred (1995). Plants of the Rio Grande Delta. University of Texas Press. p. 232. ISBN 978-0-292-77070-6. ^ a b "Capsicum annuum L. bird pepper" (PDF). International Institute of Tropical Forestry. United States Forest Service. Retrieved 2010-07-16. ^ "Wild Desert TepÍn Pepper". Redwood City Seed Company. August 27, 2008. Retrieved 2009-01-18. ^ "Chile Pepper Heat Scoville Scale". Home Cooking. About.com. Retrieved 2010-07-16. ^ "Texas State Symbols". About Texas. Texas State Library and Archives Commission. Retrieved 2010-07-16. ^ "The Wild Chile Botanical Area". Department of Biology, University of Washington. 2005. Archived from the original on 2009-05-31. Retrieved 2010-03-15. ^ a b Horst, Todd (2001). "Native Seeds/SEARCH Tradition and Conservation" (PDF). Cultural Resource Management. 24 (4): 23–26. Archived from the original (PDF) on 2010-05-27. ^ Ball, Jackie; Denise Vega; Uechi Ng (2002). Plants. Gareth Stevens. p. 25. ISBN 978-0-8368-3218-1. 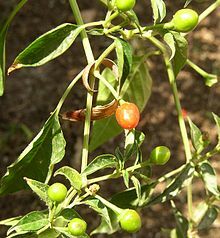 Wikimedia Commons has media related to Capsicum annuum var. glabriusculum. Video, of the Colombian variation called Aji Chirca, derived from the indigenous word for these chillies. This page was last edited on 9 April 2019, at 09:10 (UTC).